Editor’s note: This article, originally published in the March 1995 issue of the Grapevine-2, is a shortened version of a manuscript that may be read in its entirety at the Olivia Rodham Memorial Library, along with samples of graphite and copies of the references cited in the text. The complete manuscript includes a bibliography and greater detail about Nelson’s geologic past. Anyone interested in exploring the Nelson graphite mines may consult the manuscript and maps in the Library. Please note that all of the mines are on private property and permission for entry must be granted by the owners. Among the distinctions that grace Nelson and its environs is the presence of three historic graphite mines. The mines – small “open pits” – are inconspicuous to the casual visitor because they are generally misnamed, because they lie off the beaten path, and because they have become overgrown with brush, moss, and lichen. One of them, the so-called Town Farm Lead Mine, was landscaped many years ago to look more like a formal garden than a mine. Another, the Osgood, was during its time of operation the largest graphite mine in the United States, an attribute well disguised by recent overgrowth. These old holes-in-the-ground look trivial now, but 150 years ago they were the foci of enormous ingenuity, entrepreneurial spirit, and hard physical labor. Their history is described below. The future of graphite mining in Nelson can be dealt with summarily: there is none. Graphite has about the simplest chemical formula conceivable, namely “C”; it (like diamond) is one of the several mineral forms of the element carbon. In nature, graphite is silvery gray to black, platy (like mica), typically fine-grained (sooty to match-head sized plates), soft and “carveable,” and unctuous or greasy to the touch. It is a moderately rare mineral, except in New Hampshire and New York. Folks have hunted for graphite and dug it out of its host rocks since of the dawn of the Bronze Age 5,200 years ago. Commercially, graphite falls in the class of “Industrial Minerals,” commodities that are mined for what they are, not for what they contain. Ice, mica, and garnet are other examples of industrial minerals. Graphite’s Latin name is “plumbago,” from “plumbum,” the Latin for “lead.” The English language inherited the same duplicity, and we are stuck with a confusion that has run through the ages between the metal lead in pipes and the “lead” in pencils. The two “leads” have no physical or chemical kinship; they are as unlike as aluminum and coal. It is highly desirable to drop the archaic term “plumbago” altogether. “Graphite” is the proper term, although “plumbago,” “lead,” and “black lead” are still misguidedly used for it. In the New England area, our native Americans used graphite, gathered in Nelson as well as elsewhere, to strengthen fired clay pots and for body and face paint. In Colonial times, flake graphite was pulverized, mixed with clay, and extruded like spaghetti to make pencil “leads.” It was formed into crucibles for early silver casting, was used for molds for the same, and was the only reliable lubricant of the times for the clocks and locks of Beacon Hill, the wagon and coach wheels of Yankee commerce, and the capstans of clipper ships. It was also a pigment in black stove paint. Today the United States is totally dependent on imports for its supplies of graphite, mainly from Mexico, Brazil, the Malagasy Republic, and Sri Lanka, to the tune of 40-50,000 tons per year at about $700 per ton. Where Are the Nelson Mines? The three defunct graphite mines in the immediate Nelson area we will call the Town Farm, the Osgood, and the Newell Mines. I plan to do pace-and-compass physical and geologic maps of each of the mine areas during the summer of 1995; the maps will be available in the Olivia Rodham Memorial Library in Nelson. It is really fun to walk the areas (with permission) and to figure from slumped walls and blurred depressions where the offices, the store rooms, the ore-sorting floors, the loading bays, the rail beds, and the waste dumps at these old mine sites were. The Town Farm Mine is about two miles west-southwest of the Nelson green off the Lead Mine Road, on the Francis property. The Newell Mine is closer to town. It is so-called for its location near the old Gad Newell place currently occupied by Terry Mednick and Betsy Street. The Osgood Mine, once called “J. Seabury’s Lead Mine” and the largest of the trio, is on a woods road off the Old Stoddard Road, on the slopes of Osgood Hill. Unfortunately, it is hard to see graphite in the walls of the old mines as we search them today. For one thing, the thickest, most obvious, purest stuff was mined out in the earliest days. The walls of the mines that we see today are the “outer limits” of what could be extracted at a profit, and are not surprisingly “lean” in remnants of the original graphite mineral matter. There may well be some remains of good stuff in the pit floors, but they are now mostly covered either by water or washed-in debris. In 1986 Rumble and Duke [see the bibliography in the unabridged version for citations] published a “graphite map of southwestern New Hampshire” that shows 53 minor locales and 16 old graphite mines between Mount Kinsman and the Massachusetts border, all west of Concord. There was a good-sized one at Goshen called the Franklin Pierce Mine, once owned by that president. Others were at Bristol, Antrim, Marlborough, Walpole, and just south of Keene. Most of these mines operated within the same time frame, from the 1840s toward the 1900s. The Newell Mine: Mining in the Nelson area may well have begun as an Indian activity; the veins at the Newell occurrence were well exposed and apparently easily discovered early on. Jackson (1844) reported that graphite mines were operating in the 1840s in the agricultural “off-season” in Goshen, Antrim, and Nelson, probably at the Newell Mine. In the 1840s, brothers Silas, Edward, and Payson French leased mining rights on the Newell property from Oliver and Gad Newell, paying $7 per ton of graphite extracted. Powdered graphite brought 3 to 5 cents a pound at the time, about $80 a ton, so they probably made a fair profit. In 1850, they sublet the property to a Massachusetts company (the Phoenix Company of Taunton), thereafter receiving $20 a ton for the mined product, an automatic $13 per ton profit. But the veins were narrow and short, and the deposit was probably worked out by 1855 and so has lain fallow for 140 years. 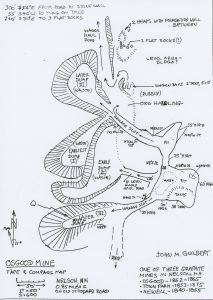 The Osgood Mine: The Osgood graphite veins were discovered in 1852, and property owner Ira Robbins sold them then to J. and J. Seabury, a New York mining company; Jacob Seabury also bought the Town Farm Mine in 1858. The Osgood, or J. Seabury Lead Mine, operated through the Civil War, closing in about 1865. It reportedly produced 30 tons of graphite in one unspecified three-month period, a heroic rate of production for those days. The mine probably employed 20 to 25 men, whose toil in hammer-and-steel drilling, gunpowder blasting, and hauling must have been formidable. Big blocks of waste rocks on the dumps still show odd triangular-shaped drill holes, presumably the result of steam-powered drill bit chatter. The waste dumps and mine workings at the Osgood are the most informative to the curious adventurer, and graphite can still be found there. The Town Farm Mine: This deposit was discovered in 1853 on what was then the 156-acre Nelson Town Farm, and the selectmen were quickly authorized to sell the mining rights. The S. C. Griffin Company had a lease on the graphite veins as early as 1855; Parke Struthers (1968) reported that the Griffin company showed “some of their American Lustre stove polish and several specimens of plumbago from their quarries” at the Nelson Fair on October 3, 1855. Levi E. Priest, Agent for the Town of Nelson, sold the farm property in May 1858 to Sewell Day of Nelson for $1300, with the Griffin lease on the graphite protected along with a lease that Silas French’s heirs had acquired. Thereafter, land ownership and transfer got complicated and graphite was apparently produced only on a small-scale, irregular basis until after the Civil War. From 1869 to 1875, Hamilton Waddell operated the Town Farm Mine, first for the New York Black Lead Mining and Manufacturing Company, then for himself. While he strove to blast and haul the graphite, however, two forces overtook him. One was that water kept draining into his pit, requiring costly pumping; the other was the deteriorating business climate and depression after the Panic of 1873. In 1875, Waddell went into bankruptcy, and the mine closed forever. For that brief six-year period, however, it was a pretty good mine. Elliot (1941) described the operation in some detail, including that there was a 20×40-foot shed on the north side of the pit where men with sledge hammers broke up the graphitic rocks, culled the graphite, and tossed it into bags or barrels for shipment to the railhead at Keene or to the pulverizing mills at Hillsboro, on the way to Boston. There were steam engines, steam-powered rail tram lines, and steam-driven pumps, all wood-fueled. The mine produced 80 to 90 tons of graphite per year, with some 4x4x6-foot blocks coming from the main vein. Some 5,000 tons of waste rock and more than 500 tons of graphite were excavated. The mine probably employed 15 to 20 workers. Several other companies owned the property in ensuing decades, but no further production was attempted or achieved. So, the recorded lifespan of the three mines totals only 46 years from 1844 through 1875, the Newell 1844-1855 (11 years), the Osgood 1852-1865 (13 years), and the Town Farm 1853-1875 (22 years). Not counting the skim of glacial sand, gravel, and soil that makes up most of the surface around Nelson, there are only two major underlying rock types, the Rangeley Formation and the Kinsman granite. They are the bedrock, more popularly known as “ledge.” Please see the maps and article by Thompson in the Nelson library for more detail than we can give here. The older rock type is the Rangeley Formation of Silurian age; it underlies the whole area of Nelson center, Center Pond, Silver Lake, Childs Bog, Harrisville Pond, and Tolman Pond. Cobb, Osgood, Blood, Hurd, and Hardy Hills are all underlain by it. These rocks were deposited 430 million years ago as sediments on the floor of a seaway, probably one like today’s Sea of Japan. So they started out as a 6,000-foot-thickness of “layer cake” sedimentary rocks, like those in the wall of the Grand Canyon. But WHAM! In what geologists call the Acadian Orogenic event, the land mass of Europe slammed into North America 400 million years ago, much as India is colliding with southern Asia today. County-sized slabs and wedges of rock were sliced, pushed over one another, contorted, buried, heated, and compressed, and injected by masses of molten rock that solidified to form the second of our major rocks around Nelson, the Kinsman granite. The Kinsman granite is really distinctive, once you know it; lots of local steps and stepping stones are made of it, like Barry Tolman’s farmhouse step. It’s not the fine-grained “salt-and-pepper” speckled gray granite (like the posts in his yard) from the quarries at Marlborough, Fitzwilliam, or Concord; it has big crystals of light gray feldspar in a dark, fine-grained matrix. You see it all around Nubanusit Lake and Spoonwood, because a tongue of it extends from its main outcrops around Hancock southwest under Spoonwood and Nubanusit and the Meadows past Mosquitoville and behind the Clymer place down to the inlet to Harrisville Pond. Most of the Hancock area is underlain by it, as is Skatutakee Lake. Look for it when you’re walking those parts! As mentioned, the Kinsman granite was molten when it was injected into the folded and contorted Rangeley rocks, and it metamorphosed them as it advanced, then cooled and crystallized. The sediments were cooked to gneisses, slates, and quartzites. Graphite grew wherever carbonaceous matter was originally in the Rangeley rocks, and, at the same time as the metamorphism, some of that graphite was dissolved in hot water from the granite, transported through fractures in the Rangeley rocks, and deposited in those cracks. That is why most of the graphite in the three old mines was in veins, the cracks that were solution conduits. Other minerals formed with the vein-veinlet graphite include quartz, tourmaline, muscovite, sillimanite, ilmenite, and rutile. The Osgood, Newell, and Town Farm Mines are all within a mile of two of the Rangeley-Kinsman contact, as are the other mines listed earlier, and they were definitely “hot spots” that got “cooked” when the granite melt invaded. There are some really odd minerals that occur with the graphite especially at the three Nelson deposits that suggest to me, an ore-deposit geologist, that there is yet another mode of origin involved, that some of the graphite was deposited in the original Rangeley sediments by a process associated with sea-floor hot springs, like the “black smokers” that we see today on the mid-oceanic rises. But for the most part, the graphite of the Nelson mines is hydrothermal in origin and was emplaced as part of the metamorphism that developed when continents collided and the Kinsman melt (Hancock) invaded the Rangeley units (Nelson). And it sat there for 400 million years until stalwarts like the Frenches, Newells, Seaburys, and Waddells wrested it from the rocks in a brief period 140 years ago. About the author: John M. Guilbert, born in Dedham, Massachusetts, married Mary Clymer of Harrisville in 1954. An Economic Geologist, he has worked in industry, as a consultant, and for 30 years as a professor at the University of Arizona. He and Mary reside in Tucson and, during the summer, on Nubanusit Road and the clay tennis court at Tolman Pond in Nelson. He is author of many journal articles and a textbook on the geology of ore deposits. From his daughter: It is my pleasure and deepest honor to announce to his friends and his colleagues and almost especially his former advisees and students, that my father, Professor John M. Guilbert will be inducted into the Mining Hall of Fame in Leadville, CO along with a few other distinguished members of the Mining/Geological community in September of 2018. This is probably the highest honor and recognition he could have reached, but seemed to do it with ease and grace. Dad loved the lay of the land, the formation of rock and sediment, then discovering what “riches” lay within it and THEN educating anyone he could find who would listen about what he knew almost more than anything else in life.